The frontend allows you to step through a program line-by-line or instruction-by-instruction, interrupt running programs, set breakpoints, examine the contents of the call stack, local and global variables, etc. Within Qt Creator, the raw information provided by the engine is displayed in a clear and concise manner, simplifying the process of debugging. In addition to generic IDE functionality: stack view, views for locals and watchers, registers, etc, Qt Creator comes with additional features to make debugging Qt-based applications easy. The debugger frontend knows about the internal layout of several Qt classes such as QString, the QTL containers, and most importantly QObject (and classes derived from it). Therefore, it is able to present Qt's data clearly. Gdb Requires gdb version 6.8. Debugging Tools for Windows Using this engine requires you to install the Debugging Tools for Windows 32-bit or 64-bit package (Version 6.10 for the 32-bit or the 64-bit version of Qt Creator, respectively), which is freely available for download from the Microsoft Developer Network. The pre-built Qt SDK for Windows will make use of the library if it is present on the system. When building Qt Creator using the Microsoft Visual C++ Compiler, the "%ProgramFiles%\Debugging Tools for Windows" path will be checked to ensure that all required header files are there. In Debug mode, several dock widgets are used to interact with the program you are debugging. The frequently used dock widgets are visible by default; the rarely used ones are hidden. To change the default settings, select Debug and then select View. Here, you can lock or unlock the location of your views as well as display or hide them. Among the views you can display are Breakpoints, Disassembler, Modules, Registers, Debugger, Stack, and Thread. The position of your dock widgets will be saved for future sessions. Breakpoints are shown in the Breakpoints view which is enabled by by default. This view is also accessible when the debugger and the program being debugged is not running. A breakpoint represents a position or sets of positions in the code that, when executed, interrupts the program being debugged and passing the control to the user. The user is then free to examine the state of the interrupted program, or continue execution line-by-line or continuously. Typically, breakpoints are associated with a source code file and line, or the start of a function -- both allowed in Qt Creator. Also, the interruption of a program by a breakpoint can be restricted with certain conditions. At a particular line you want the program to stop -- click on the left margin or press F9 (F8 for Mac OS X). At a function that you want the program to interrupt -- enter the function's name in Set Breakpoint at Function... under the Debug menu. By clicking on the breakpoint marker in the text editor. 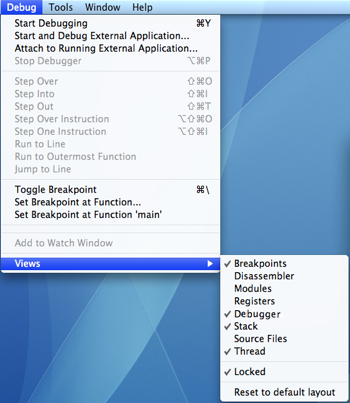 By selecting Delete Breakpoint from the breakpoint's context menu in the Breakpoints view. Breakpoints can be set and deleted before the program has actually started running or while it is running under the debugger's control. Also, breakpoints are saved together with a session. To start a program under the debugger's control, select the Debug menu and Start Debugging, or simply press F5. Qt Creator then checks whether the compiled program is up-to-date, rebuilding it if necessary. The debugger then takes over and starts the program. Note: Starting a program in the debugger can take considerable amount of time, typically in the range of several seconds to minutes if complex features (like QtWebKit) are used. Once the program starts running, it behaves as usual; performance-wise as well. The user can interrupt a running program by selecting Interrupt from the Debug menu. The program is automatically interrupted as soon as a breakpoint is hit. You can use the debugger views to examine the data in more detail. To finish debugging, Press Shift+F5. A line of code can be executed as a whole with F10; to execute a function or a sub-function, use F11. Alternatively, you can continue running the program with F5. It is possible to continue executing your program until the current function completes or jump to an arbitrary position in the current function. When the program being debugged is interrupted, Qt Creator displays the nested function calls leading to the current position as a call stack trace. This stack trace is built up from call stack frames, each representing a particular function. 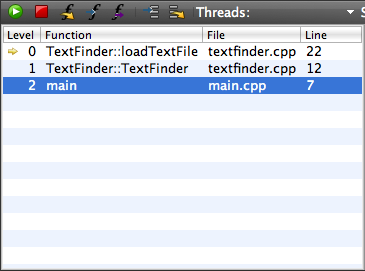 For each function, Qt Creator will try to retrieve the file name and line number of the corresponding source files. This data is shown in the Stack view. Since the call stack leading to the current position may originate or go through code for which no debug information is available, not all stack frames will have corresponding source locations. These frames will be grayed out in the Stack view. If you click on a frame with a known source location, the text editor will jump to the corresponding location and update the Locals and Watchers view, making it seem like the program was interrupted before entering the function. If a multi-threaded program is interrupted, the Thread view or the combobox named Thread in the debugger's status bar can be used to switch from one thread to another. The Stack view will adjust itself accordingly. Whenever a program stops under the control of the debugger, it retrieves information about the topmost stack frame and displays it in the Locals and Watchers view. This typically includes information about parameters of the function in that frame as well as the local variables. Compound variables of struct or class type will be displayed as "expandable" in the view. C lick on the "+" to expand the entry and show all members. Together with the display of value and type, the user can examine and traverse the low-level layout of an object's data. Gdb, and therefore Qt Creator's debugger works for optimized builds on Linux and Mac OS X. However, optimization may lead to re-ordering of instructions or sometimes even complete removal of some local variables. In this case, the Locals and Watchers view may show unexpected data. The debug information provided by gcc does not include enough information about the time when a variable is initialized. Therefore, Qt Creator can not tell whether the contents of a local variable contains "real data", or "initial noise". If a QObject appears uninitialized, its value will be reported as "out of scope". However, not all uninitialized objects can be recognized as such. The Locals and Watchers view also provides access to the most powerful feature of the debugger: comprehensive display of data belonging to Qt's basic objects. To enable this feature, select Use Custom Display for Qt Objects from the Debug menu.The Locals and Watchers view will be re-organized to provide a high-level view of the objects. For example, in case of QObject, instead of displaying a pointer to some private data structure, you will see a list of children, signals and slots. Similarly, instead of displaying many pointers and integers, Qt Creator's debugger will display the contents of a QHash or QMap in an orderly manner. Also, the debugger will display access data for QFileInfo and provide access to the "real" contents of QVariant. The Locals and Watchers view can be used to change the contents of variables of simple data types such as int or float when the program is interrupted. To do so, click on the Value column, modify the value with the inplace editor, and hit Enter (or Return). Note: The set of watched items is saved within your session. With this feature, debug information from the Qt library itself is not loaded when the application starts up, thereby reducing the startup times for some applications. You can then use the Modules view to manually load this information, if required. Note: In this scenario, some breakpoints may not be triggered by the debugger. By default, both the Disassembler and Registers view are hidden. The Disassembler view displays disassembled code for the current function; the Registers view displays the current state of the CPU's registers. Both views are useful for low-level commands such as Step Single Instruction and Step Over Single Instruction. While debugging Qt Creator dynamically loads a helper library into your program. This helper library enables Qt Creator to pretty print Qt and STL types. The Qt SDK package already contains a prebuilt debugging helper library. To create a debugging helper library, select the Options from the Tools menu, and go to the Qt/Qt Versions pane. As the internal layout of qt can change between versions, the debugging helper library is built for each Qt version. In our TextFinder example, we read a text file into a QString and then display it with a QTextEdit. Suppose, you would like to look at this QString, line, and see what data it actually stores. Follow the steps described below to place a breakpoint and view the QString object's data. First, we set a breakpoint on the line where we invoke setPlainText() by clicking between the line number and the window border. Then, select Start Debugging from the Debug menu or press F5. Breakpoints are visible in the Breakpoints view, shown below, in Debug mode. If you wish to remove a breakpoint, simply right-click on it and select Delete breakpoint from the context menu. To view the contents of line, take a look at the Locals and Watchers view. tr("I have reached the end of the document. Would you like "